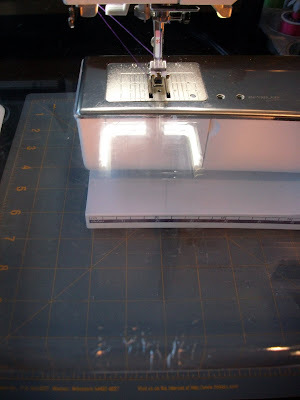 Sew Many Ways...: Tool Time Tuesday...Is Your Sewing Machine Drafty? 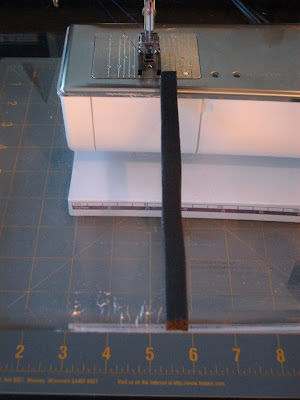 Tool Time Tuesday...Is Your Sewing Machine Drafty? I thought that title would get you. This is what my extension table looks like. 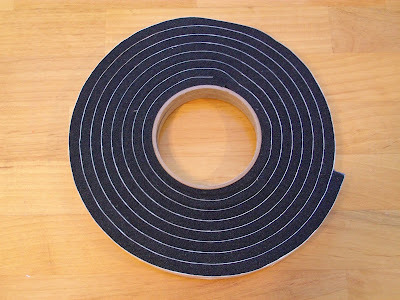 Sticky tape in different places. I use it to guide me when I 'm doing half square triangles and when I'm chain piecing a pile of fabric. To be honest with you, it's starting to look like crap! The tape is dirty and peeling and I thought the yellow tape was painter's tape, but it's not and it's a mess as you will see in a minute. Even though I have a 1/4" presser foot, I still like a guide further down on the table so I can chain piece faster. So I saw this on my husband's work bench. We needed to buy some to seal up the back door from drafts. We have 2 sizes, one wide and thick and one narrow and thin. For this Tool Time, I used the narrow thin kind. It's 3/8" wide and 5/16" tall. This package came with 2 rolls with a total of 20 feet for $3.00. I don't know about your sewing machine, but mine only needed about 6 inches, so when you buy a package, share it with a sewing friend!!! You can find this in any hardware store. 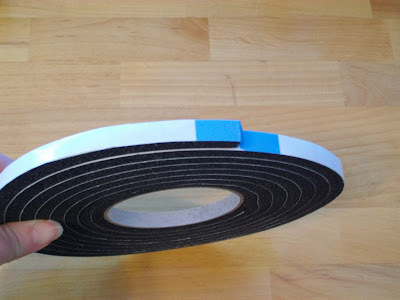 The tape is sticky on one side and is black. The white paper is on there so it won't stick to itself on the roll. The first step is to take off old tape...urrrgh....I wanted to cry!! but Goof Off to the rescue. I love this stuff. Test it first if you haven't used it before. It removes every sticky thing you can think of. peel off the white paper...the foam is really sticky. I squared the top of the ruler with the throat plate of the machine so it would be perpendicular and straight all the way down. 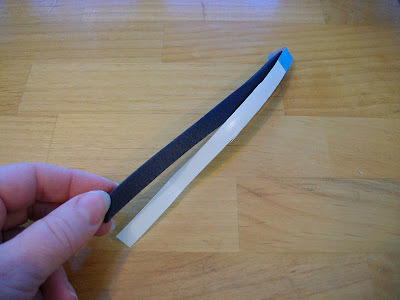 Line up the foam strip with the straight edge of the ruler and stick it in place. 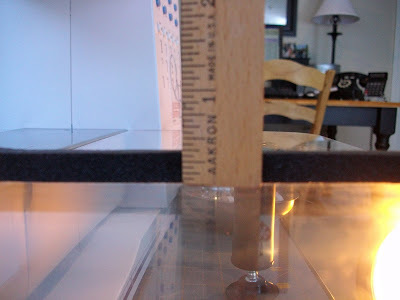 Now you are all set for a nice 1/4" seam guide all the way down your table top. This picture looks a little wonky, but it's where I squeezed the foam. This is the perfect thickness for guiding the fabric next to. 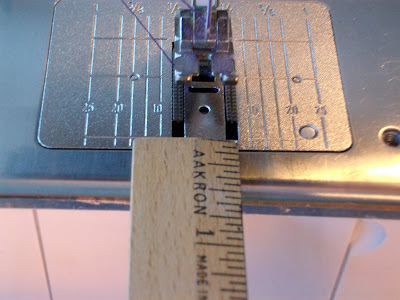 Sew a test piece first and measure for an accurate 1/4" seam allowance before you begin to sew a project. Hope this helps and just a FYI...there is a little sticky residue from this, but not as bad as the tape that you saw above. We had 2 different brands of this tape and this thin one left a little when I lifted it up, but the other didn't leave anything. 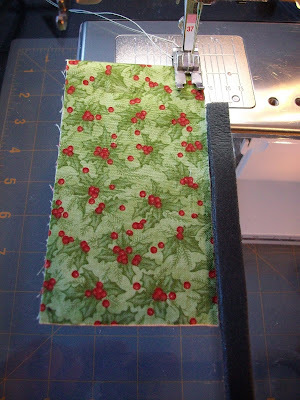 In fact, it was very easy to reposition it over and over for different seam sizes. Just give it a try, but test it first. 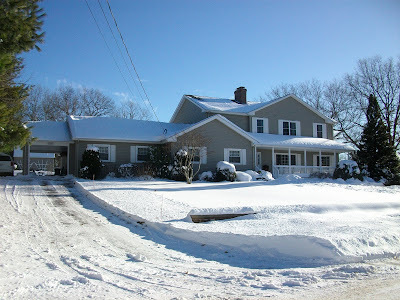 Thought I would leave you with a few pictures of the blizzard that hit us this past weekend in southern New England. 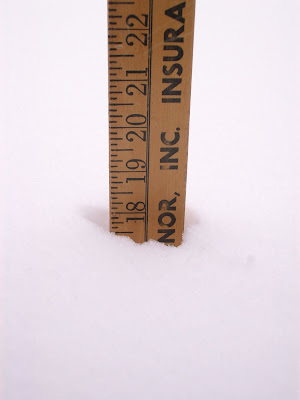 This measurement of 18" was in the middle of the storm, so I think we ended up with a little more. This is my favorite picture. 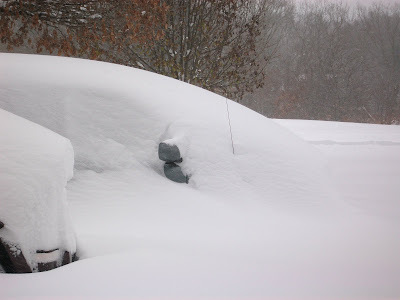 The dark car is the front of my husband's Jeep and the little spot of gray and the antenna is my Honda van completely buried. This was the next day when the sun came out, but boy was it freezing!! and it even blew up onto the porch. Added the right amount of snow to make it pretty. Those greens in the bucket is another tip with what to do with the branches from an old artificial Christmas tree. I'll be back later today or tomorrow, when I get the pictures taken of a super fast, no sew Christmas gift I wanted to share with anyone needing a quick gift. I have seen those tape all the time when my brother fixes something. What a wonderful thing plus my extension table is still clean since I only have the machine for one year exactly. 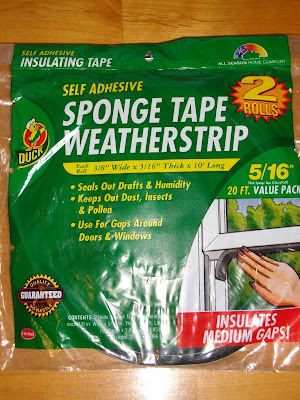 I saw someone use multiple layers of painters tape on their cutting ruler to cut more accurately, you could use the foam insulation there too! 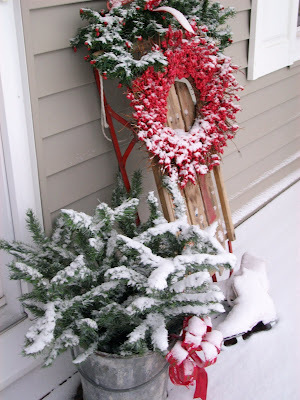 I'm sending you a photo of the Just Add Snow Kit I made being used, Just a hint we have no snow! No snow here in sunny CA, but your snowy scene does look Christmas card pretty ( but then I'm not shoveling it!). A thought for removing adhesive given to me from an owner of an antique store---use your blow dryer on low to gently 'soften' the adhesive on tape, stickers, etc. It remeoves easily and doesn't leave as much residue. Have a Blessed Christmas Karen! Clever indeed, but what I really wanted to say is ......don't you just love that Bernina quilter's table?!! 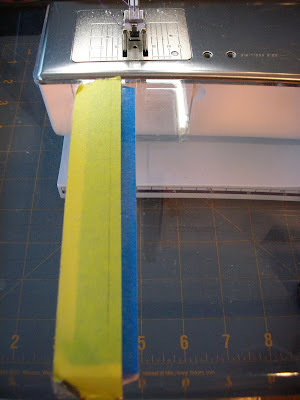 Do you also use the separate seam guide that fits into the back of your foot? Do you use the #37 or the #57? 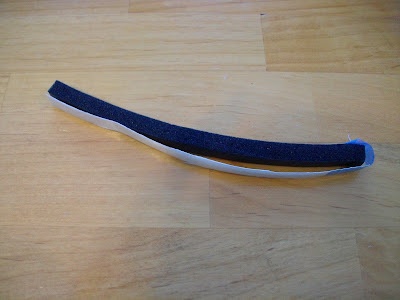 If you're using the 37, that seam guide will connect from where your foam starts all the way to the back of the foot, then you get a full seam edge. Also, here's a tip. 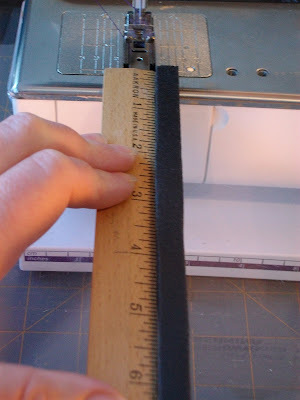 That 1/4" foot is an exact 1/4", so when you iron your seams out, they're a hair over that. 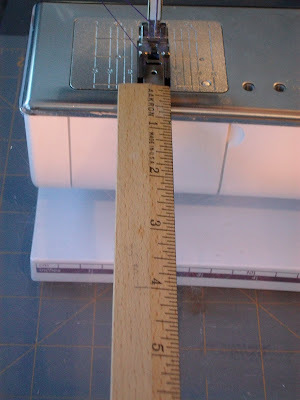 The #13 foot is a "scant 1/4"", so when you iron those seams out, they are an exact 1/4". Most of the quilting teachers in our Bernina Club have their students buy the #13 instead of the #37 or #57. Happy sewing! Love your new sewing room too. 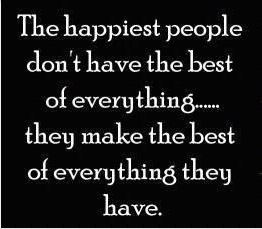 Thanks for sharing...another good one, as usual!! What a clever solution! I'm going to get some right away. Thank you so much for the wonderful tip! I will use it! You guys got a lot of snow!!! Keep warm and have a nice holidays! Yes I know the tape. I just use my extension table for quilting, and when piecing I take it of. But the thought is amazing again. I said so before, but I keep thinking you should start a column in a handy craft magazine. Great idea, Karen. We have a small hardware store, and I look at this stuff all the time. We have lots and lots of snow here in Southern NJ as well. Merry Christmas to you and your family! 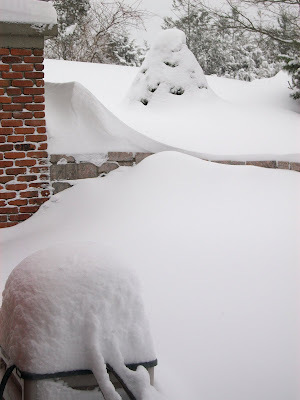 Wow...now that's a lot of snow!! 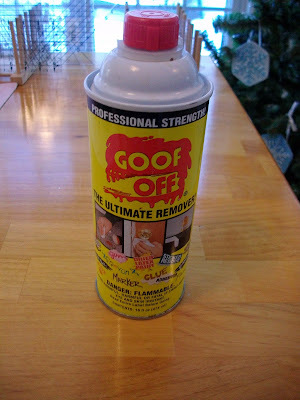 Great TTT...and thanks for the "stuff" that takes goo off also! Thanks Karen. I'm headed out to my husband's workshop right now. Great idea. The snow is beautiful. We got our big dump last week in Wisconsin with about the same amount. It makes it so pretty for Christmas. Love the left over fake Christmas tree ideas too. Karen, aren't you in Mass? I can't believe you got that much snow! Up here in Nashua NH we maybe got 3 inches at the most. It was a bust! But I was pleased. 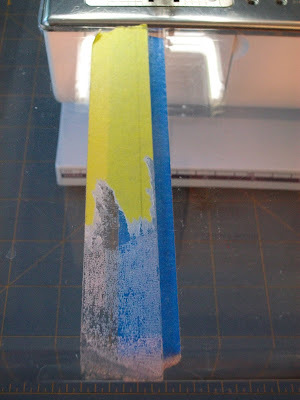 Great tip with the foam tape!